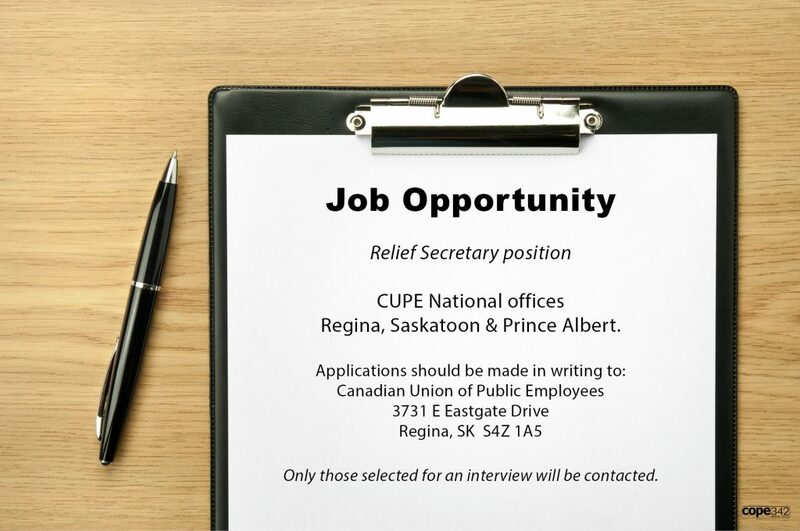 CUPE is inviting applications for temporary relief secretary clerical support positions in CUPE National Offices in Saskatchewan located in Regina, Saskatoon and Prince Albert. • Set up, compose, type, and proofread, correspondence, reports, collective agreements, proposals, presentations, news releases, forms, and other documents. • Maintain accurate filing systems (electronic and hard copy) including archiving; maintain mailing contact lists. • Create and/or update, perform searches, retrieve information and generate reports from various databases. • Assist, where required in the operations of the office: in maintaining appropriate inventory of office supplies, processing and verifying orders; receive, verify and process invoices for payment. • Receive, process and distribute incoming mail and e-mail. • Coordinate travel and accommodation arrangements, conferences, workshops, meetings and appointments. • use Office 365 and learn new software. Questions should be directed to the CUPE National Office in Regina at 306-525-5874.